I'm not a hero worshiper. I was disgusted with all the crying when Elvis died. ("Oh, get over it….." I'd think when women walked around work in tears.) I grew up on the Beatles, but John Lennon's death was just a blip on my radar. I felt sad with the loss of Mother Teresa, but at 87, she'd led a good life and was probably ready for a rest. Though prepared for it, I was hit pretty hard to open my e-mail yesterday to the subject "Steve Jobs Dead!" Of course, I didn't know the man, but he profoundly impacted my life with his inventions, with his company and through who he was. He chose the path less taken, yet based his actions on a deep belief system. Had I had the opportunity to work with this man, I would have lasted about a week. I don't do well with people who tromp on the feelings of others - no matter how basically right their convictions may be. Steve was known as a tyrant to work for, someone you probably didn't want to get caught in an elevator with at the office. But, for those stronger than I, they loved working for this man with such foresight and sense of purpose. Jobs followed his own vision - not those of someone else. In his simple Levi Jeans, tennis shoes and black turtleneck he introduced product after product to the world that has profoundly changed our lives. Not one to have all the techie gadgets (though I am seriously married to my Mac Computers), I watched as he introduced the iPad and my head started spinning! "This is REALLY going to change things in the world," I thought, as I picked up the phone to buy more stock. Yes, Steve, I do believe! 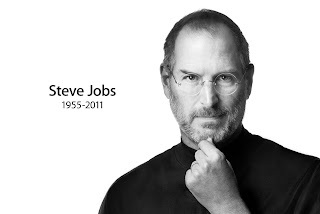 Steve Jobs was our generation's icon for successful nonconformism. As blogger Om Malik wrote, "Today, we are living in a world that’s about taking short-term decisions: CEOs who pray at the altar of the devil called quarterly earnings, companies that react to rivals, politicians who are only worried about the coming election cycle and leaders who are in for the near-term gain. While he revolutionized our world, the soul of the man was what really drew me to him. A Buddhist, a vegetarian, a man of principle, he yanked Apple's membership in the National Chamber of Commerce over their opposition of regulating greenhouse gas emissions. Bully, Steve! In a 2005 commencement speech at Stanford, Steve talked about his life, his dance with cancer and encouraged students to keep their deaths clearly in focus. "No one wants to die," he said. "Even people who want to go to heaven don't want to die to get there." But he talks about facing the mirror every day and asking himself if this was his last day on earth, if what he was doing was making him happy. If the answer was "No" too many days in a row, he changed things. "Your time is limited," he told the Standford audience, "so don't waste it living someone else's life. Don't be trapped by dogma, which is living with the results of other people's thinking. Don't let the noise of others' opinions drown out your own inner voice." I'm glad I grew up in Steve Jobs' time and I morn his loss. I encourage people to take a few minutes to watch his Stanford address at http://www.csmonitor.com/USA/2011/1006/Steve-Jobs-s-2005-Stanford-commencement-address and I add my thoughts to those of so many others. Godspeed, Steve. Thank you.